Happy Thursday everyone! How is your week going? 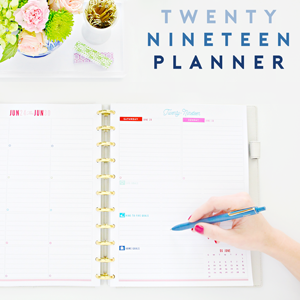 I just finished up a super fun project that I hope to share tomorrow, and it was one that included a bit of styling and editing. That is NOT my strongest talent, so I am always looking for additional advice and tips in this department. What I have learned is that there is no right or wrong way to do it, and that everyone sees and appreciates things differently. Some people only want books on a bookshelf, some love a mix and match of items. Some folks love doing everything in a monochromatic color scheme, while others use a variety of color theories to bring their shelves to life. And while some individuals believe in decorating formulas, others play until their eyes are happy. I LOVE that there is no right or wrong, but I also love to know how others find their styling groove and to read about what works for them. Karen's spaces have been featured a few times around here; everything from her home office to her pantry, and her style is always recognized and commented on. 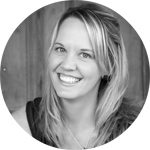 She has personally found that sticking to a few rules or tips has helped her create cohesive and functional spaces. This girl doesn't shy away from color (woohoo! 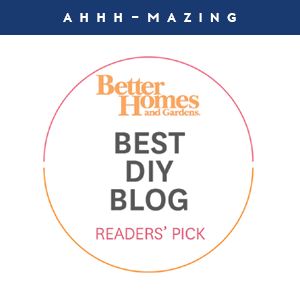 ), and is here today to share some of the tips she used when putting together a bookcase in her home. Here she is now! Hi friends! It's Karen here from A house full of sunshine. True confession: I'm a bookworm. Yep, I'm completely obsessed with books. Ask me to declutter anything from my home and I will fill that garbage bag without a blink or a tear, but try to whittle down my book hoard and you'll have to pry each beloved novel from my cold and lifeless hands. Okay, maybe I'm exaggerating a little. But I do love my books. And I have quite a collection of them. So today I thought I'd talk about how to organize and display our treasured tomes. I love open shelves for books, because I feel they add so much character and charm and warmth to a home. But many people struggle with how to style a bookshelf. Here are my top tips. 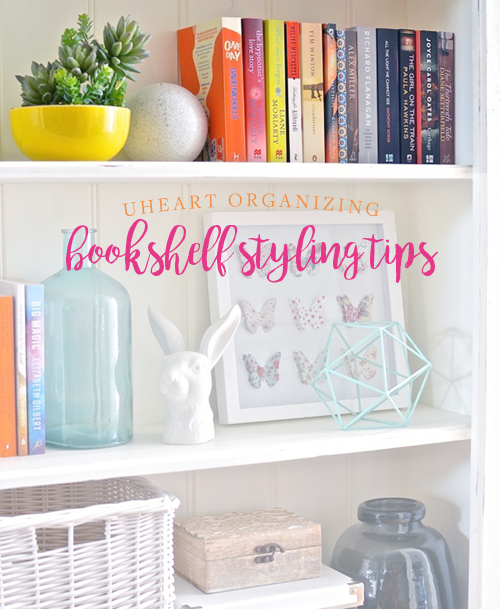 It's tempting to fill each shelf to the brim with books, but it will look much more attractive if you can spread things out a little and leave some room for styling with decorative accents. 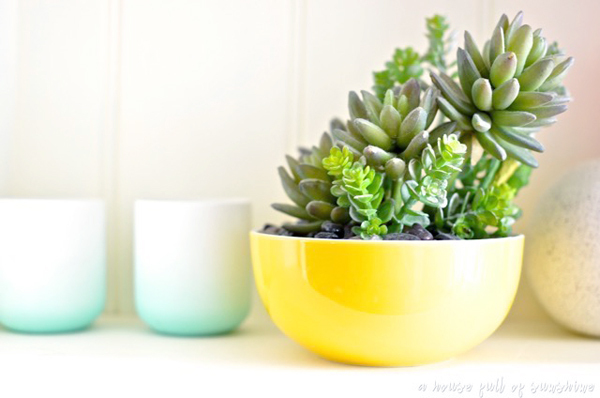 You can decorate with vases, vessels, boxes, bowls, ornaments, and artworks. Try shopping your home to see what you already have that might look attractive on your bookshelf. The problem with adding heaps of decorative bits and pieces to your shelves is that it can end up looking like a collection of random stuff from a thrift store. The way to avoid this is to tie it all together with a color scheme. Does that sound scary? It's really not. All it means is you should choose one dominant color to use throughout, and then one or two accent colors to be used in much smaller doses. A pretty print in a simple frame will draw the eye to the back of the shelf. This adds a sense of depth. Now your shelves are not one-dimensional any more - they have layers! Artworks also help to anchor the smaller items you place in front. This gives a cohesive feel and makes everything feel connected. A lot of people struggle with feeling like their shelves are filled with clutter - a whole bunch of little totchkes that have nothing to do with each other. This is usually a problem of scale: too many little things, and not enough big things. 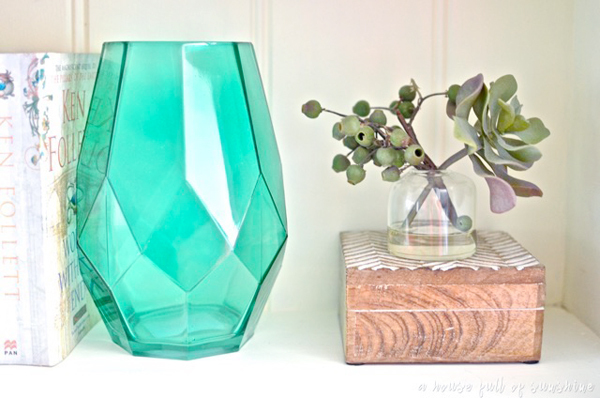 Instead, start with the big things - artwork, oversized glass vessels, large vases, chunky bookends. Then add the smaller things to balance it out. You do need a bit of both. But be careful to add those small things in moderation. Too much, and it will look like clutter. 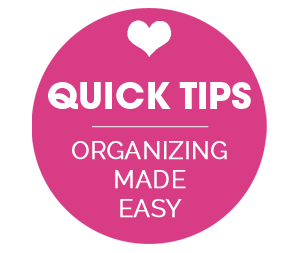 And always leave some white space around your decor items so they don't look overly crowded and busy. Vary things up to create some visual interest. 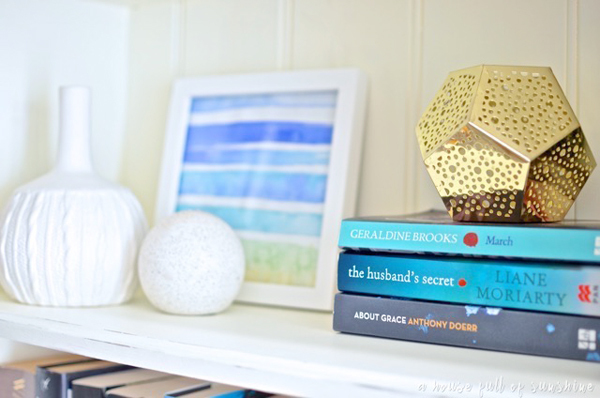 Books are not just fun to read, they also make wonderful decorative objects in their own right! Lay them down, turn them around, prop them up or lean them. Place your largest items down low, so your shelves don't look top-heavy. 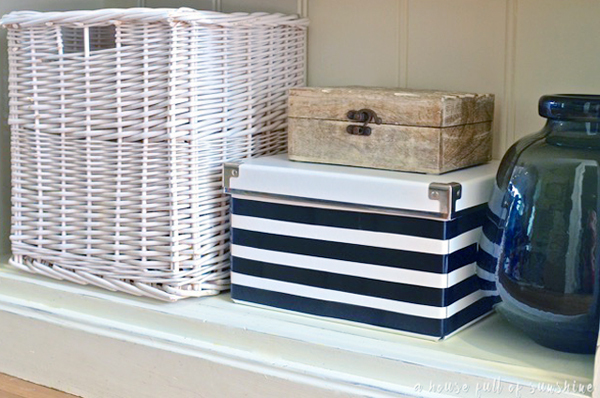 Stacks of pretty file boxes, baskets, or oversize vessels, are all great choices for the bottom shelf. Not only does this give you extra (concealed) storage, it also helps visually anchor the whole bookshelf. Stand back and have a look at your arrangement. Imagine your shelves as a set of scales - do they look balanced? If you've placed all the books to one side on one shelf, make sure you balance this out by placing books on the other side or in the middle on the next shelf down. You don't want to create a lopsided feel. 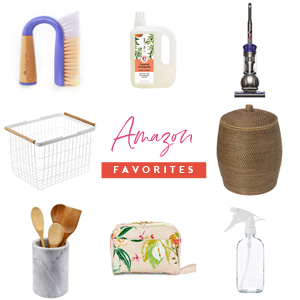 There should be something interesting on each shelf, but make sure the most visually dominant items are not directly beneath each other in a vertical line. Your eye will naturally be drawn to the most interesting objects, so stagger these at different intervals so the eye follows a gentle meandering S-shape as it travels down the shelves. Most importantly, remember to have fun with it! Don't be scared to have a go. It's fun to switch things around regularly and try new "looks" for your shelves. 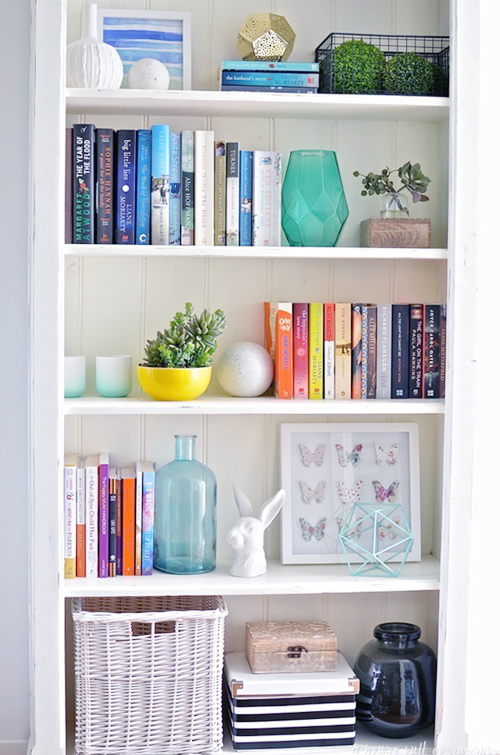 You can see my how I styled these same shelves for Spring in this post, my stencilled bookshelves here, and how I created a rainbow of color-blocked books on my daughter's shelves. Thanks for having me today, Jen! I hope you all found these tips useful. Happy bookshelf styling! 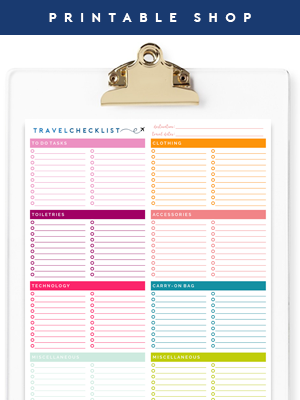 This is fabulous- I am just in the process of prettying up my bookshelf after having to empty it for new carpet, so I look forward to using some of these tips. As a fellow book lover, I can totally relate! My shelves are filled with books right now, and while that makes me happy, I know they could look better. Scale and a consistent color palette are great ideas for tying the space together. I love your shelves!! They look great!! There are a ton of articles out there explaining how to decorate a bookshelf, but the way you worded the concepts make more sense to me than anything I've read. Thank you! I think I will actually give it a try! Thank you for this post. It reinforces what I started doing last month...de-stashing the clutter in my study. I've been downsizing my book collections and knick knacks so I can bring in new, soothing pieces that reflect my personality today and not a misch-masch of items given to me.